Perform enhanced web monitor such as form data posting, ssl, content change, user login, redirects and more. 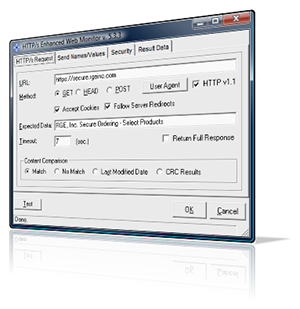 While the basic ipSentry package provides the ability to monitor web servers and make sure that specified content is received, the HTTP/s Enhanced Monitoring add-in allows you to substantially extend this capability with SSL, Secured Logon (Basic Realm & NTLM), Form Data Posting, Redirection, and other enhanced options in order to monitor your web servers using more advanced functionality. This add-in can evaluate page contents in order to trigger alerts when the content of a page changes either by calculating a base CRC value against the page content or by evaluating the last modified date as sent by the server. The form posting functionality is ideal for simulating a users actions such as posting form data to the web server or logging into a specific area of your system as well as following redirects. The HTTP/s Enhanced Web Monitor can also be used as an alerting option allowing you to post data to web servers such as web only paging systems and other web based services that allow form data or a simple URL to be sent. With the introduction of CAPTCHA showing up on many providers web based paging, you will need to contact your mobile service provider to identify a method for bypassing the visual input requirements. This add-in is definitely for when you need a little (or a lot) more horsepower in monitoring web servers than a simple GET request at the server.